The cost for this online activity is $15. This presentation was recorded LIVE on December 6, 2018 and is approximately 50 minutes. Review the published research on dietary interventions for Multiple Sclerosis (MS). Identify the mechanisms by which dietary factors may contribute to the potential worsening or improving of MS related symptoms. Review the rationale for the structure of the dietary intervention in the Dietary Approaches to Treating MS Related Fatigue Trial NCT02914964. 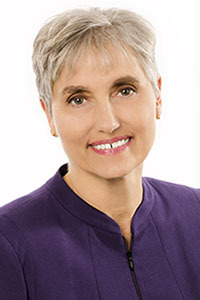 Dr. Wahls is a clinical professor of medicine at the University of Iowa where she conducts clinical trials that test the effect of nutrition and lifestyle interventions to treat MS and other progressive health problems. She is also a patient with secondary progressive multiple sclerosis, which confined her to a tilt-recline wheelchair for four years. Dr. Wahls restored her health using a diet and lifestyle program she designed specifically for her brain and now pedals her bike to work each day. Full biography. MD: This activity has been planned and implemented in accordance with the accreditation requirements and policies of the Iowa Medical Society (IMS). Des Moines University (DMU) is accredited by IMS to provide continuing medical education for physicians. DMU designates this enduring materials activity for a maximum of 0.75 AMA PRA Category 1 Credit(s)™. Physicians should only claim credit commensurate with the extent of their participation in the activity. DO: Des Moines University (DMU) is accredited by the American Osteopathic Association (AOA) to provide osteopathic continuing medical education for physicians. DMU designates this program for a maximum of 0.75 AOA Category 2-B credits and will report CME and specialty credits commensurate with the extent of the physician’s participation in this activity. Other Health Professionals: This enduring materials activity is designated for a maximum of 0.75 AMA PRA Category 1 Credit(s)™.